The Metropolitan Woman's Club is a nationally chartered GFWC with a commitment to community service. For the past 45 years the MWC has sponsored the Miss Lexington Scholarship Pageant. Pictured above is MWC member Louise Wieman who was honored at this year's pageant for her years of service to the organization by having the community service award given in her name. This past year alone the club members have raised over $100,000 for charitable organizations. 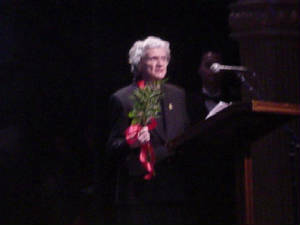 Since 1998 the Metropolitan Woman's Club has donated $30,000 to breast cancer research. The MWC also supports two nursing endowment scholarships, one at the University of Kentucky and one at Lexington Community College for a non-traditional student. As sponsors of the Miss Lexington/Miss Metropolitan Scholarship Pageant the Metropolitan Woman's Club awarded over $10,000 in cash scholarships and over $375,000 in in-kind scholarships to colleges and universities in Kentucky this year alone to young ladies between the ages of 17 and 24. Each contestant received a minimum $250 scholarship for participating in the pageant. In addition to earning scholarship dollars, competing in this program enables the young women involved to highlight their community service involvement, sharpen their interview skills, enhance their onstage poise, showcase their talents, and form lifelong friendships with other contestants. MWC members serve in numerous capacities on the pageant committee. The Co-Chairs for this year's pageant were Karen Carter and Melanie McCloud. 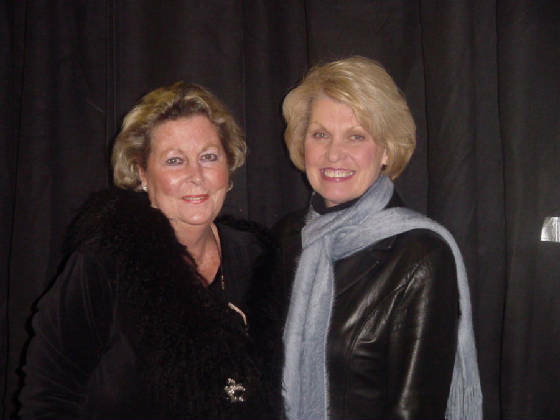 Pictured above just prior to the beginning of the 2005 pageant are pageant co-chair, Karen Carter, and former pageant co-chair, Judy Hutchinson.